The Department of Materials Science and Engineering (MSE) at the University of Pennsylvania dates to 1946 when four industrial scientists (Francis Tatnall, Ad Schaffer, Robert Yarnall, and Francis Foley) raised $240,000 to establish the School of Metallurgical Engineering. The early faculty appointments included Robert Brick, the first department chair, Norman Brown (a metallurgist), Louis Girifalco (a physical chemist), John Hobstetter (a physical metallurgist), Erwin Parthe (an X-ray crystallographer), Doris Kuhlman-Wilsdorf (a mechanical metallurgist), and Robert Maddin (a physical metallurgist) who was one of the founders of the Laboratory for Research on the Structure of Matter, LRSM. 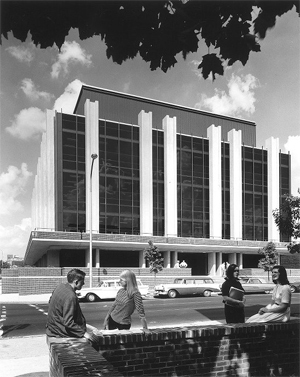 The new School was originally located in the Towne Building, and it remained relatively small until the early 1960’s when DARPA established one of the first three university interdisciplinary Materials Research Laboratories here, leading to the construction of the LRSM in 1963, the current home of the MSE Department. With DARPA funding and the interdisciplinary research opportunities presented through the LRSM, the expansion of the department in the 1960s was dramatic. The first electron microscope was introduced by Norman Brown. Charles McMahon (NAE Election Year 1980) began his studies on the temper embrittlement of steel. In the mid-1960s, Wayne Worrell brought expertise in the chemical and electrochemical properties of high-temperature materials, and Geoff Belton joined the department as another chemical metallurgist. David Gaskell added to our expertise in high temperature thermodynamics and kinetics and Erwin Parthe added expertise in X-ray crystallography. Campbell Laird joined the department and started his research on phase transformations and fatigue. David Pope specialized in high temperature intermetallic alloys, and Charles “Chad” Graham established a program on magnetic materials. It was also in the sixties when Solomon Pollock (a solid state physicist) and Edward Korostoff (a physical metallurgist) established a research program in biomaterials and began their pioneering work on the effect of electric fields on bone growth. Sol subsequently became chair of the new Department of Bioengineering at Penn. In 1973, the department officially changed its name, first to Metallurgy and Materials Science, and then to Materials Science and Engineering. The 1970s brought new faculty to further strengthen the department’s leadership in metallurgy and others to broaden the scope of materials studied. Vaclav Vitek (NAE Election Year 2006) began modeling grain boundaries and the mechanical behavior of metals at the atomistic level. Takeshi Egami used theoretical and experimental techniques to investigate quasi-crystals and oxide superconductors. In 2002, Takeshi moved to the Oak Ridge National Laboratory and the University of Tennessee-Knoxville with a named professorship. In the late seventies, Gregory Farrington brought expertise in the field of fast ionic conductors, particularly beta-alumina and polymer electrolytes, and later became Dean of Engineering at Penn before moving to Lehigh University as University President. Further diversification of the department faculty occurred in the 1980s. Peter Davies, who would serve as Department Chair from 2002-2016, brought expertise in solid state chemistry and ceramics. Jack Fischer, cited as one of the world’s top 20 scientists in the field of nanotechnology, joined MSE from the Electrical Engineering department at Penn. Bill Graham came to the department in 1986 with expertise in geometric, electronic, and vibrational properties of surfaces, interfaces and thin films. Dawn Bonnell (NAE Elected Member 2013), currently Penn’s Vice Provost for Research, introduced scanning tunneling microscopy of metal oxide surfaces and interfaces. David Luzzi specialized in high resolution transmission electron microscopy and nanomaterials and in 2007 moved to Northeastern University to become Dean of Engineering. In the 1990s the department extended its commitment to covering all areas of materials by hiring two faculty in polymers. Russell Composto brought knowledge of high energy ion scattering methods and polymer surfaces and interfaces in 1990, and is currently Associate Dean for Undergraduate Education in Penn Engineering. Karen Winey added expertise in polymer morphology and block copolymers to the department and became Department Chair in 2016. The ceramics program was also strengthened through the addition of I-Wei Chen as a full professor from the University of Michigan. Shu Yang became the first new hire of the 21st Century, bringing expertise in the synthesis of nanostructured polymer-based materials with novel functionality. The addition of Ritesh Agarwal strengthened the department’s expertise in the chemistry of inorganic materials and nanostructured optical materials. Christopher Murray connects chemistry and materials science, researching the synthesis, characterization, and integration of nanostructured materials. He became Penn’s first Penn Integrates Knowledge (PIK) University Professor between science and engineering. Vivek Shenoy was recruited to strengthen our research in mechanical behavior and is currently the Director for Penn’s Center for Engineering Mechanobiology. David Srolovitz, (NAE Election Year 2015), a former graduate student with Vaclav Vitek, brought broad expertise in computational materials science. He holds a 50:50 appointment in MEAM, and is Director of the Penn Institute for Computational Science. Dan Gianola added expertise in nanomechanical studies and moved to University of California, Santa Barbara in 2016. Ertugrul Cubukcu brought expertise in metamaterials and devices and moved to University of California, San Diego in 2016. Vijay Kumar became Dean of Engineering in July 2015 with the goal of dramatically increasing the faculty size and since then MSE has hired four professors. In 2016, Eric Detsi was hired with a focus in nanoporous materials fabricated by novel electrochemistry. Eric Stach moved from Brookhaven National Laboratory in 2017 to be a full professor and has broad expertise in electron microscopy. Liang Feng also came in 2017 and specializes in metamaterials, devices and optical properties. Also in 2017, Vanessa Chan became the first Practice Professor in MSE and also contributes to the Engineering Entrepreunership program. A departmental history would be incomplete without acknowledging our long-time staff members. These include Bob White and Debbie Ricketts in electron microscopy, who were followed by Doug Yates and Jamie Ford, now associated with the Singh Center for Nanotechnology. Bill Romanow ran the metallurgical lab for 45 years, and was followed by Steve Szewczyk as the Manager of Instructional Laboratories. Raymond De La Veaux supervised the materials testing lab and was followed by Alex Radin, who retired after 30+ years. In the departmental office, we benefit from the long service of Irene Clements (since 1970), Pat Overend (since 1986), and Vicky Lee (since 2007). The structure of the current undergraduate program dates to 2004 when the curriculum was remodeled around the theme of nanoscale materials science and engineering. This required a number of new courses and the modification of the rest. As a result of this change, the undergraduate enrollment in the department increased along with a dramatic rise in student involvement and enthusiasm. The Department looks forward to continued advances in its research and teaching programs as it enters a period of strategic hiring to build upon its leadership in advanced materials.